Colovian Traders is a general store located in the northern half of Skingrad. 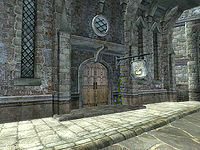 It is found across the street from the Mages Guildhall and next to the West Weald Inn and All Things Alchemical. The proprietor, Gunder, has 800 gold and a Mercantile skill of 40. When bartering, he will buy anything from you while only selling a variety of miscellaneous items. His wares also include the unique Vest of the Bard, a shirt which drains your Willpower while fortifying your Personality and Speechcraft. He currently employs Eyja, a commoner, although after you have bought the "Servants Quarters" upgrade for Rosethorn Hall she will ask you for work. The store also sells all of the upgrades for Rosethorn Hall for a base cost of 1600 gold. Gunder and Eyja live upstairs from the main trading room, as is usual with Skingrad houses and stores. Gunder will always have a Chainmail Helmet in his inventory. For lower level characters this item would not be obtainable in other situations. This store is absolutely full of items, from books, to clothing, to weapons to gold, and is a great place for thieves to gather some loot to fence. This page was last modified on 24 December 2016, at 22:56.